As a child and young adult, summertime for me meant sunkissed hours perched on a tiny board as I blasted across the water behind an obliging boat. My Dad had a mission to teach water skiing to every person we ever met during the summer and first on his student list were me and my siblings. 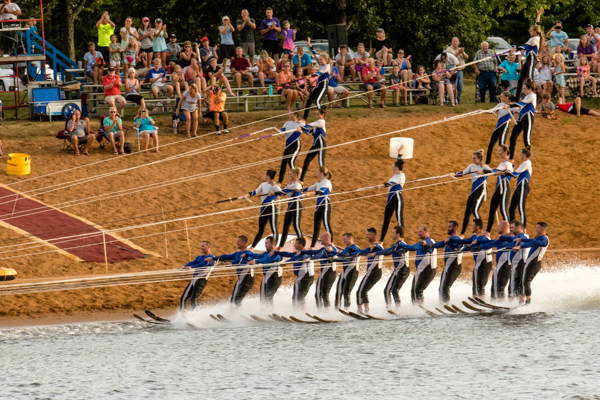 No, my friends, relatives and I never mastered complicated waterski pyramids. But some of us (Icy Weathers??) could have probably won an endurance award for long distance skiing if one had been offered. Those memories resurface when I learn that the Wisconsin Rapids Aqua Skiers perform nearby. 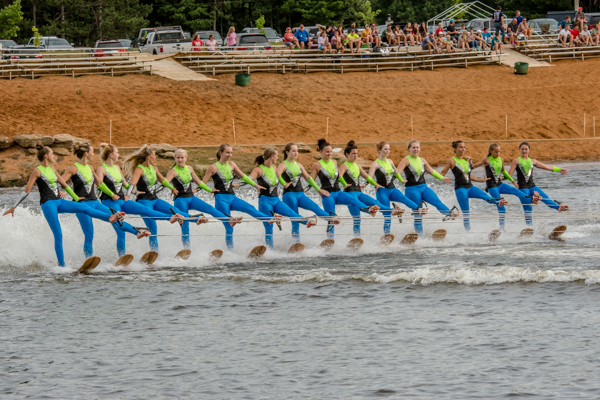 Wisconsin is home to many amateur waterski troupes. That seems odd to me considering they have to wait for the lakes and rivers to thaw before practice is feasible. Even then, I imagine their season is short. I am not sure that the water ever gets warm enough for me to consider skiing here. I can’t resist the chance to watch though. Armed with a general idea of the lake’s location, I convince Storm to accompany me for an afternoon outing to Wisconsin Rapids. 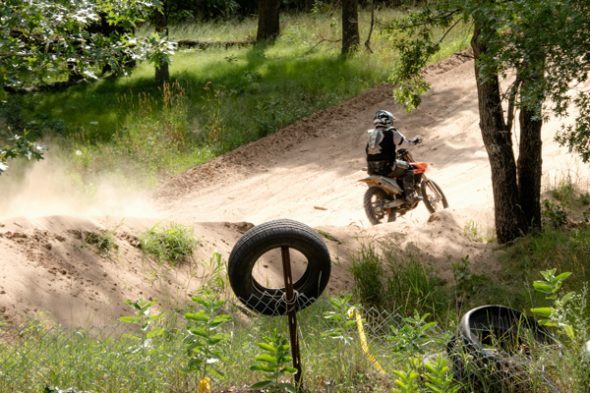 Along the way, we discover several Wisconsin recreational areas devoted to motorized fun. In addition to these ATV/Motocross parks, most of the back roads we travel are marked as ATV/Snowmobile routes. 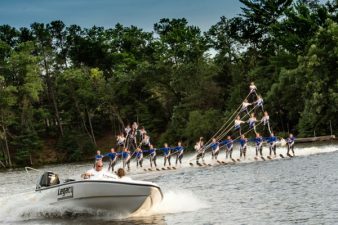 At Lake Wazeecha, we stretch out near the water’s edge to enjoy the early evening practice performance of the Aqua Skiers. If you are hardy enough, you can swim at one of several beaches here. South Park rings Lake Wachazee with peaceful spots to relax, to picnic or to hike along the lake edge. 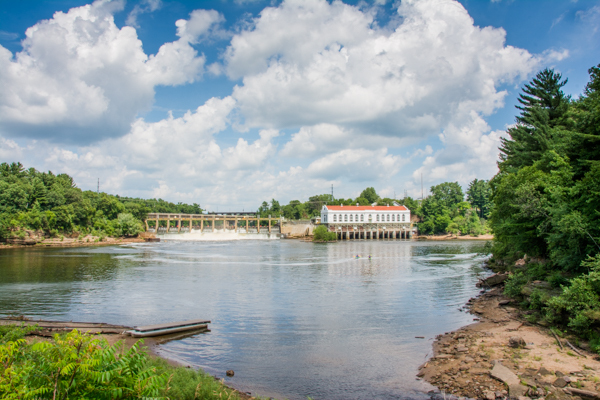 If you like to play outdoors either on land or water, Wisconsin is a lovely place to do it! Hey Storm, you can tell you ain’t in Myrtle Beach any more, no thong bikinis! Deb – I remember going there when I was a kid and we traveled from NY to CA by car for 4 weeks. At 10, I was awestruck. 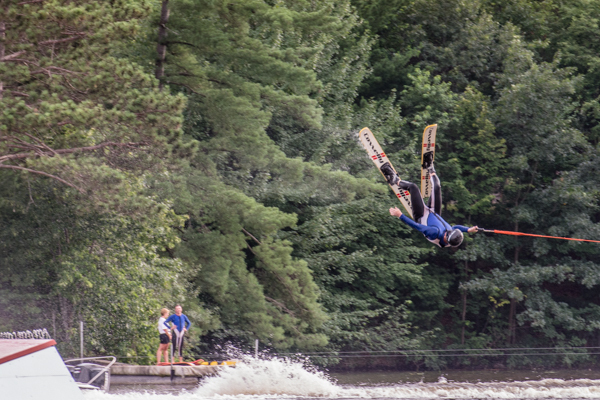 You’ll have to teach me how to water ski…whenever I tried (in Maine…brrrrrrr) I ended up doing belly flops instead. 🙂 I enjoy your posts very much. Hi Mary! It is great to hear from you!! I wonder if I could do anything but belly flops myself now 🙂 It would be fun to try to teach you, but I definitely think we need much warmer water than they have here. Thanks so much for following us. The greatest humiliation in life is to work hard on something from which you expect great appreciation, and then fail to get it.